Before I try to install Streams and TCP/IP, let's try VP/IX. I got three 1.2MB disk images, but to install it with my 1.44MB floppy drive in my 486-PC, I had to convert the disks first. How ? Easy if you already had installed XENIX. Now type in 'custom' again, choose '4' (for additional packages) and if asked, insert the first of the three floppy disks. You should select 'ALL' as an option, a bit later you had to insert the other two disks also. When you typed in the serial number/activation successfully, it should go back to 'custom'. Just exit. Now how to run VP/IX ? Easy if you know it. Just type in 'vpix' on console. 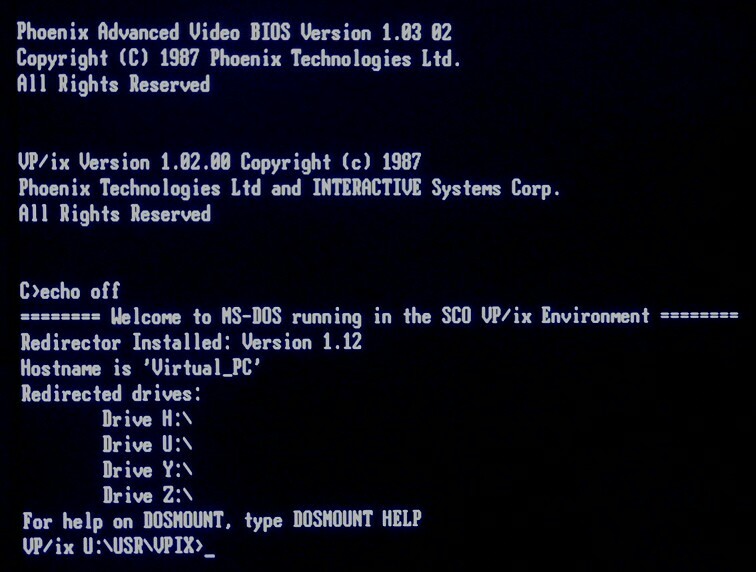 Even a BIOS is loaded, similar to modern virtual machine software. Now you are able to type in DOS commands. 'VER' returns DOS 3.30. Using ALT-F1, ALT-F2 and so on you can run DOS more than once... nice. To exit VP/IX, type in 'vpixcmd quit' ... that's all. Using Google there is almost nothing to find about VP/IX .... strange. But next time I will tell you my expiriences with TCP/IP and XENIX, promised. 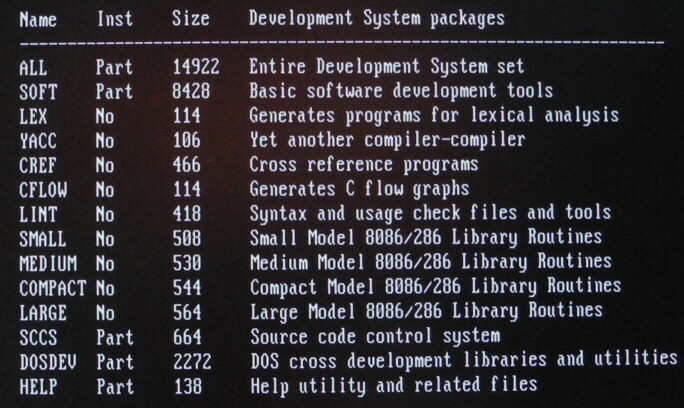 Installing the XENIX 2.3.0d Development System isn't so hard. Assuming you managed it to write six 1.44MByte floppy disk images back to real floppy disk media with success, you just have to enter 'custom' at the XENIX system prompt. Then you have to choose '2' for Development System, '1' for installing one or more packages, and then 'ALL' for all packages. Be patient then, reading each disk will take a bit time. Each disk contained a TAR file, which can be opened from any Windows machine with WINRAR also with ease (just open the image file of the floppy disk with WINRAR). After all disks are processed, you have to enter the serial and activation code. After the system prompt reappeared, I tried to enter a small but famous test program. But I could NOT enter the closing bracket '}' ... it's not available with my german keyboard. That's ugly, but because I had no time to figure out how to fix it, I just write the small text file in Windows, copied it to a floppy, and used 'doscp' to get the file into XENIX file system. Remember - running the program without preceeding './' needs '.' to be added in PATH variable. 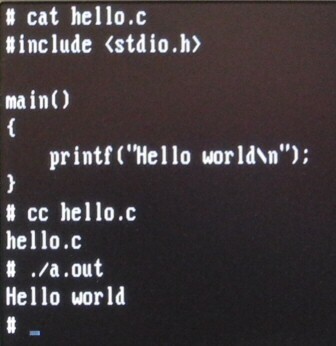 And without any cc option, the generated program is always named 'a.out'. In one of the next parts, I will describe installing and using TCP/IP. For a dev system manual, look at the related link below. P.S. : I solved the problem with the german keyboard layout. You have to replace a file named 'keys' within the /usr/lib/keyboard directory with a modified version, then you have to run 'mapkey' one time. The modified 'keys' for my german keyboard can be downloaded >here<. If unsure, backup your original 'keys' file first before replacing it. Well, sometimes you would like to try something you never tried before. So after installing many times Linux on my newer PCs, I thought it would be fine to have Xenix 386 also installed, to play with it, or better, to compile some programs also (e.g. the "hack" game). After I got the 7 Xenix floppy disk images (N1, N2, B1, X1, X2, X3, X4 for 3.5" HD media) from someone, I had to write the images back to real floppy disks first. Unfortunately WINIMAGE does not know how to handle non-FAT formatted floppies. Also, RAWWRITE (using real raw images) does only write tracks (sub)sequentially back, so if you write 720KB images back to a HD floppy disk, RAWWRITE generates junk. So I decided to use my "disktool" I already used also for writing CP/M-86 disks. 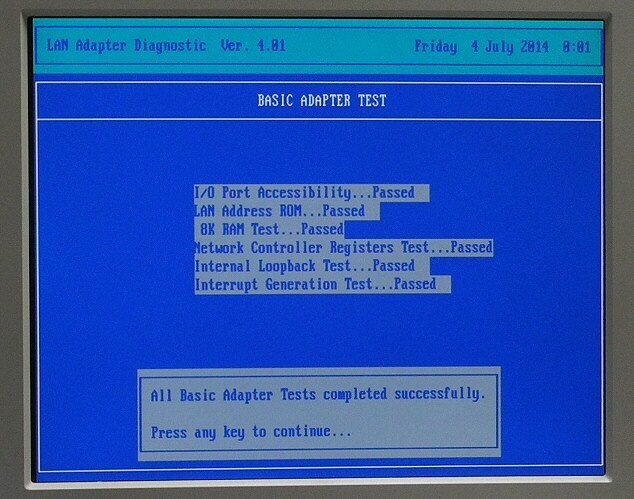 After this, I tried to boot from the N1 (the only one which boots)floppy disk. This worked as intended, but after going on within the installation dialog, I recognized there should be non-used space left on your harddisk to create a Xenix Partition. I wanted to have a DOS partition (1st Partition) and also a Xenix Partition (2nd Partition). It was a bit strange because I thought I can "re-use" the already existing extended DOS partition, which I didn't used so far. No, I had to go back to DOS, start FDISK, and delete the logical and extented partition first. THEN I was able to go on, choosing "Create XENIX Partition". Btw. this was not really bad luck, because before I rebooted it for FDISK, I choosed to display the partition info within the Xenix installation dialog (and I remembered these numbers later on when creating the Xenix partition...). Some uncommon questions raised then, after I was able to wrote the base/minimal system. It asked me not only for a name of a non-american timezone (for me, CET), it asked me what parameters the timezone have, and what name the summer time has (? for me, it was always CET+1, but Xenix don't like to get a '+' in the name of the timezone). My last floppy I had to insert, N2, had an error, and I got also a strange message "tar: tape read error".... I didn't used a tape, but on all other floppies except N1 just a single big tar file is existing. So I had to use another floppy disk, which was prepared in hurry from me again, too. Then at the end, it asks me for a "link kit serilization". I didn't expected again such a question because I already typed in the serial number for the OS. The whole installation (option 'ALL') occupied 13.3 MByte. Part 2 will follow with the description of my experience I made with the XENIX development environment. P.P.S. 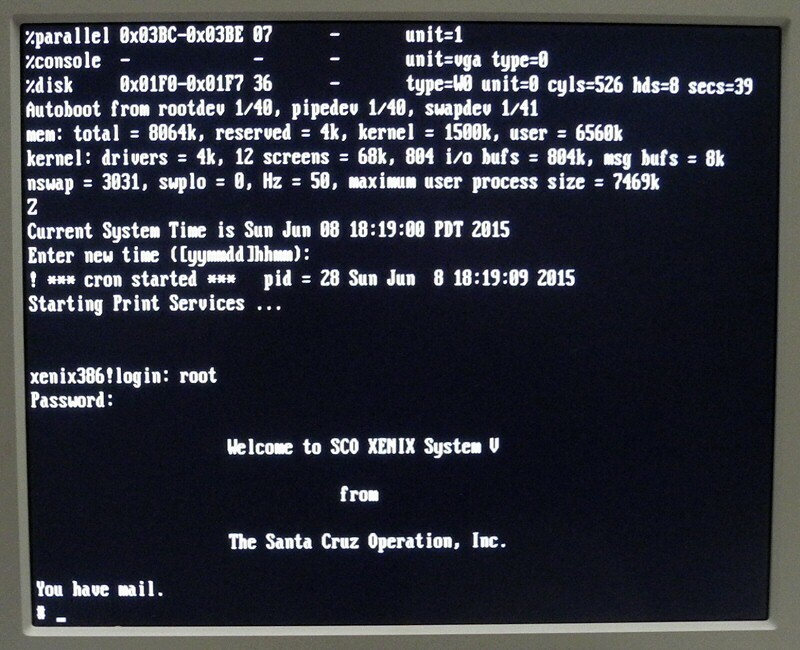 : Beware of the Y2K bug in Xenix. Look for xnx427d.Z in known internet search engines. 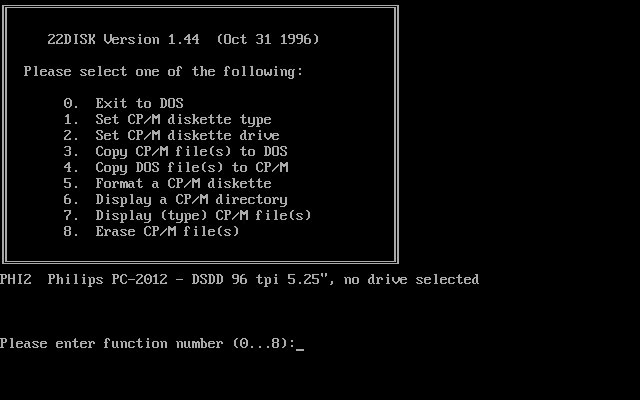 How to figure out structure / disk parameter of an unknown CP/M floppy disk ? Meanwhile - more than only one time - I got mails with questions about unknown CP/M floppy formats. Often computer are mentioned, which are used in industry only, or names from SBC / self made systems were telled. So how to figure out structure or disk parameter of a floppy disk of an unknown system ? If you have access to that unknown system, take a look at the build-in floppy drive - at least you will get the model/type of the drive itself, and then you know how many tracks are used, e.g. if a TEAC FD55FV is used, usually 80 tracks is the number of tracks. Also, you know then it's a double density drive, and MFM coding was used. If you don't have access to the original system, just the floppy media, it's much more difficult. You can use devices like Kryoflux or SuperCard Pro, this is the most easy way. If you own a PC with installed MS-DOS (not Windows!) and at least a floppy drive with the same physical media dimensions (e.g. 5.25 inch), you can use ANADISK. ANADISK can help to get the needed disk definitions (e.g. Skew, DPB values etc.) for 22DISK, which can be referred as a companion software of ANADISK. To alter the definition file of 22DISK, you have to decompile them first (with STRIPIDX). BEGIN A1 Generic CP/M - SSSD 8"
A complete description of these parameter can be found in 22DISK documentation (usually included in the programs ZIP file). You have to have an understanding about the disk structure of CP/M disks in general. Take a look inside the CP/M Alteration Guide, Chapter 6.11 (see related link also). After figuring out the parameters (these parameters typically are very often more or less similar or equal to already existing entries ! ), you can re-compile the disk definition file back to a binary file (with GENINDEX). If all parameter were correct, you can use CTOD or DTOC for transfering single files, or you can use the main program to copy a whole floppy disk. For more infos about transfer CP/M files, take a look also at my "Transfer page".